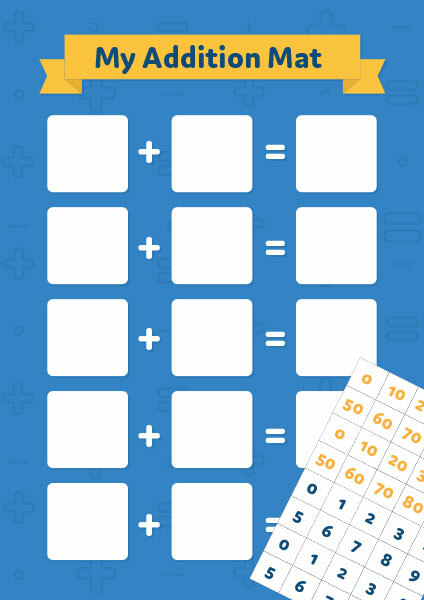 Ideal to use as a number warm-up activity when learning how to add two-digit and one-digit numbers together or two-digit and two-digit numbers together. Children select two number cards then complete the number sentence by filling in the answer with a removable marker. Print, cut and laminate a class set of My Addition Mats and Number Cards. Provide each child with their own laminated My Addition Mat and set of Number Cards. Ask the children to select two cards, one from the yellow number card pile and one from the blue number card pile. Children place the two numbers in the first two squares of the My Addition Mat to create a number sentence. The children then solve the problem and record the answer with a removable marker in the last square. Children repeat the activity until they have solved 5 number problems. Support and extend children by changing the selection of number cards. A black and white version of this resource is also available.